It’s another Saturday morning, grey and misty. I am starting where I am. My desktop is cluttered with my cross stitching of Jesus. I have puddles of socks, slippers and Sheba’s toys at my feet. Yes, I am a messy disorganized lass. I’m working on it, ok? I’ve been tired and overwhelmed the last few days. I’m picking myself up, trying to dust myself off and start again where I left off. If I was to ‘fix’ everything before I start anything, I would still be in my mother’s womb. I’m doing the best I can. I’m obsessive, persistent and slow as a tortoise. We all know the story of the tortoise and the hare. We slowpokes can win. I’m not winning today though. It’s difficult to get past go. I’m leaving the race for another day. It’s no point in fighting, going upstream. I haven’t lost ground but maintaining my stand. I am still starting each day with meditation. It’s good to begin with a clean slate/mind. Some days my slate is cleaner than others. I’m reading my books page by page in order, not skipping ahead. It requires a lot of discipline from me. Patience is not my virtue but I am sitting with my discomforts, breathing in and out, watching my thoughts float by like clouds in the sky. Yes, I’m easily addicted, watching too many episodes of Longmire and Call the Midwife on my iMac. It is soothing for my aggitated mind but I’m not wasteful with my time. 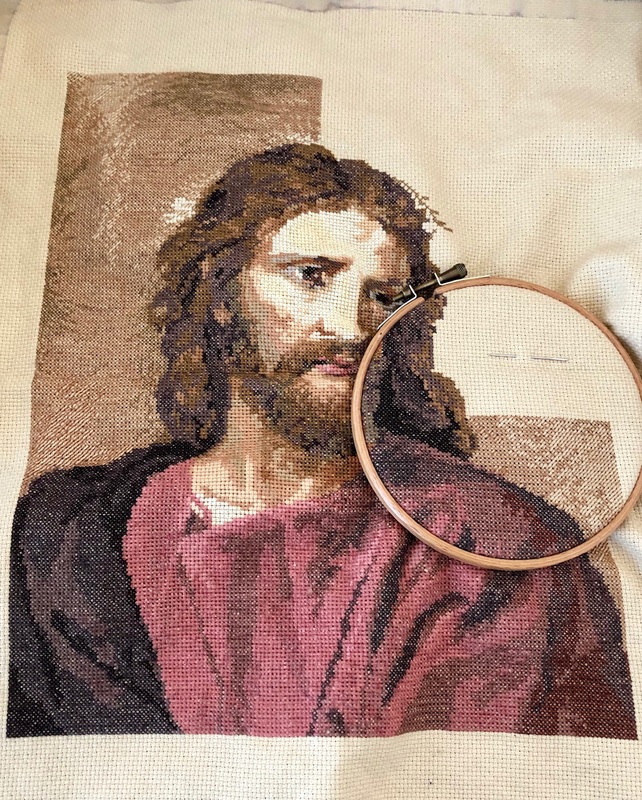 I am stitching Jesus while I’m watching, making good progress. Yes, I’m multi-tasking but it is relaxing. It does not make me fret. Finishing Jesus is one of my goals. I’m killing several birds with one stone, sorta speak. So here I am, almost at the end of the day. I’m glad to be back in this space, tapping out this post word by word. I’m finding rhythm tapping on the keyboard. The exercise grounds me. Documenting my days, charting my progress enables me to see my way ahead as well as where I have erred in the past. This entry was posted in Uncategorized and tagged addiction, breath by breath, charting, discipline, documenting, grounding, life, patience, progress, slow poke, the race, the tortoise and the hare, writing. Bookmark the permalink.